Certain homes just steal your heart the moment you look at them and this one does that to me. 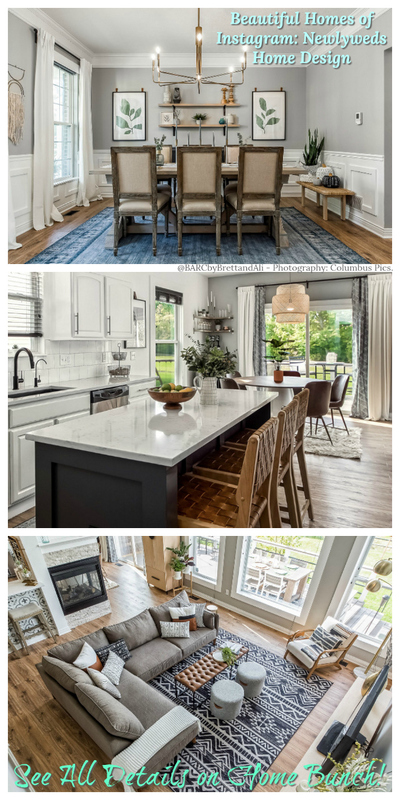 Recently built by my friends at New Old LLC (previously featured here & here), this is the type of home that you build and chances are you won’t want to change a thing for a very long time. 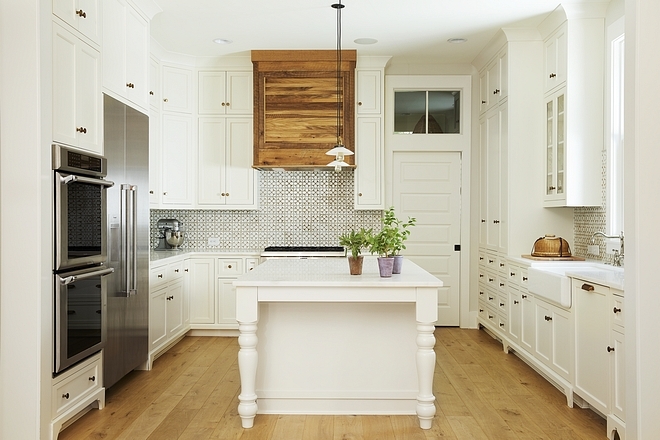 Classic lines with a hint of unexpected rusticity (take a look at that reclaimed wood kitchen hood! 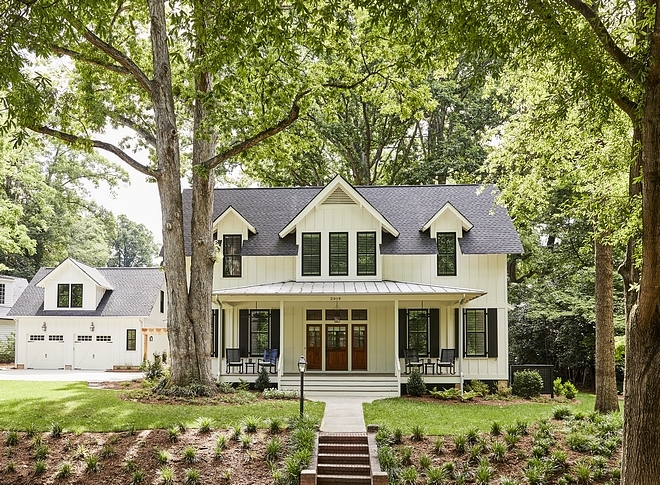 ), makes this Southern-style farmhouse home a timeless inspiration. Take notes on all sources shared by this incredible builder and feel free to pin your favorite pictures. Have a good time, my friends! 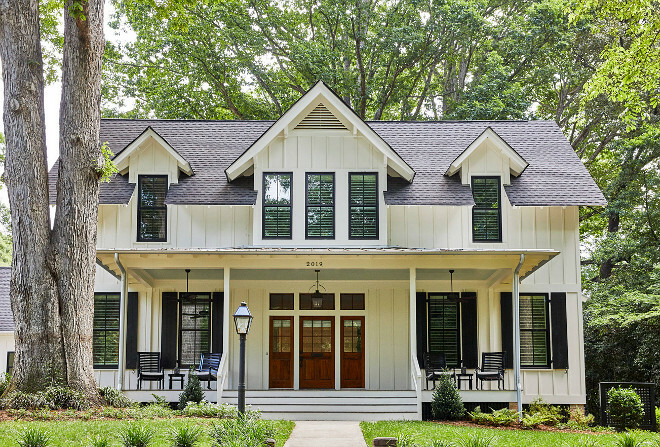 This is how a Southern farmhouse should look like! Dreamy, right? 🙂 That front porch is just so inviting! 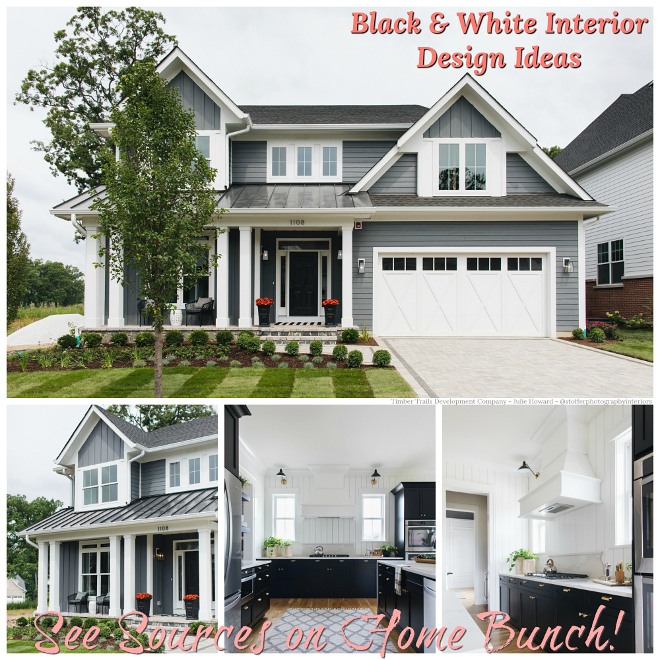 The exterior color is Dover White by Sherwin Williams. 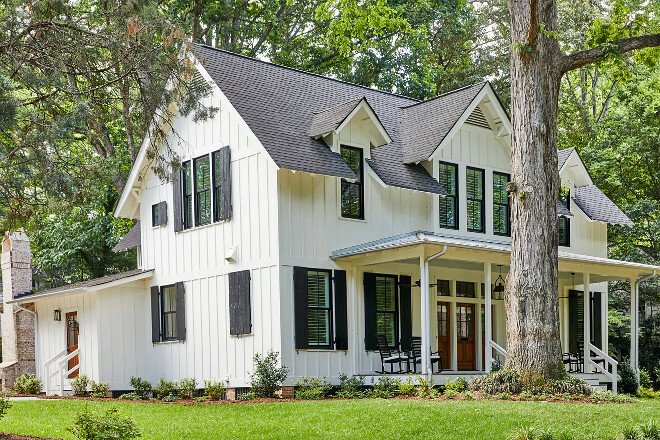 This is a great off-white paint color for siding. 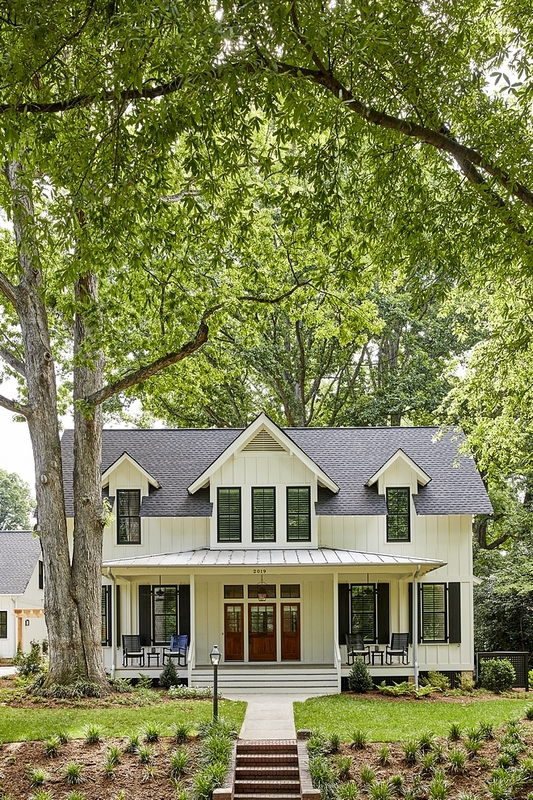 Porch Ceiling Paint Color: Benjamin Moore Palladian Blue HC-144. 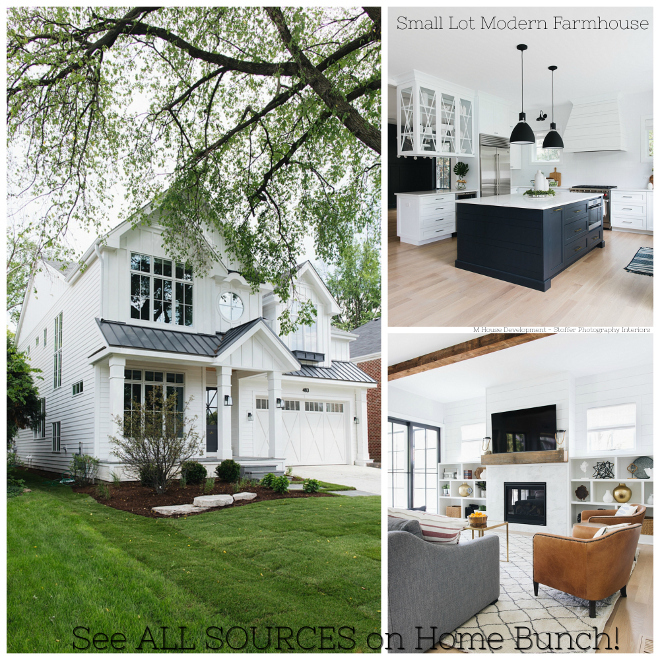 Rocking Chairs: Grandin Road – similar here. Front Door: Wood – Douglas Fir; Stain Color: Provincial. This kitchen is really inspiring me. 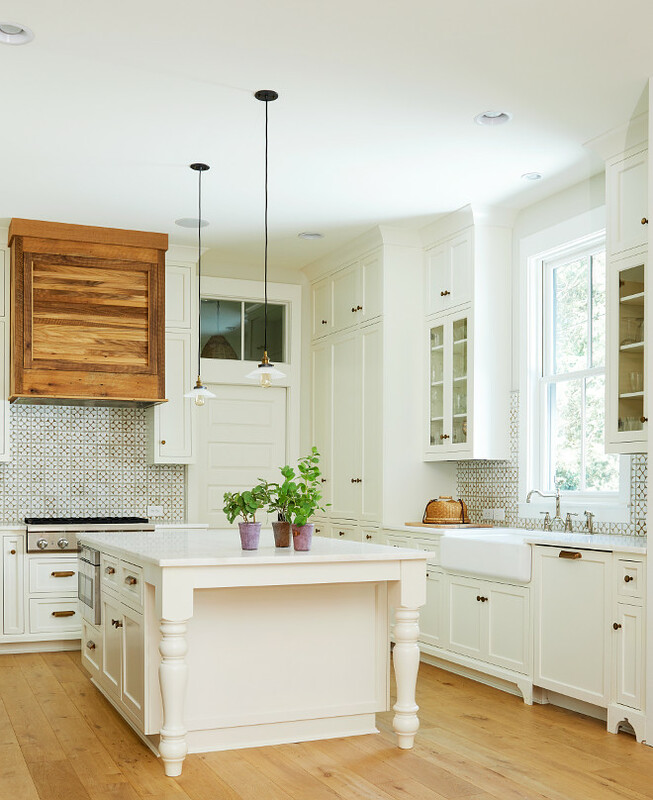 Floor-to-ceiling cabinets create a seamless and classic look to this kitchen. 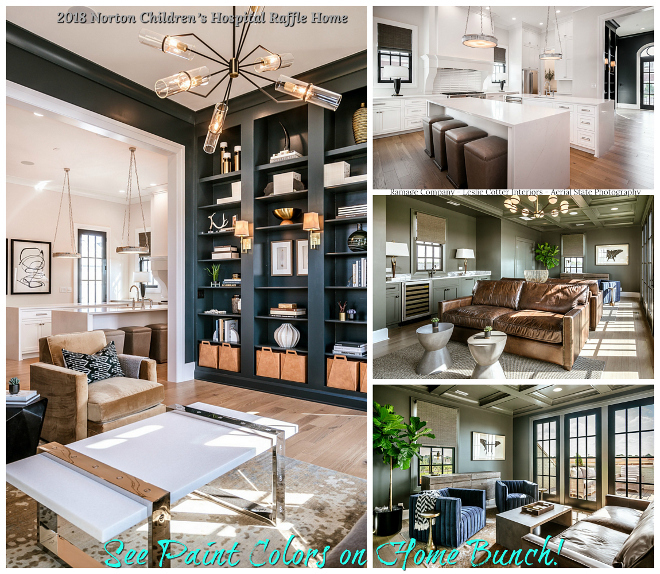 All walls are painted in Sherwin Williams SW7637 Oyster White – Flat. All trim is Benjamin Moore Simply White OC-117 – Semi-gloss. Ceiling color is Benjamin Moore Simply White OC-117– Flat. This stunning type of hood became this builder’s “trade-mark“. 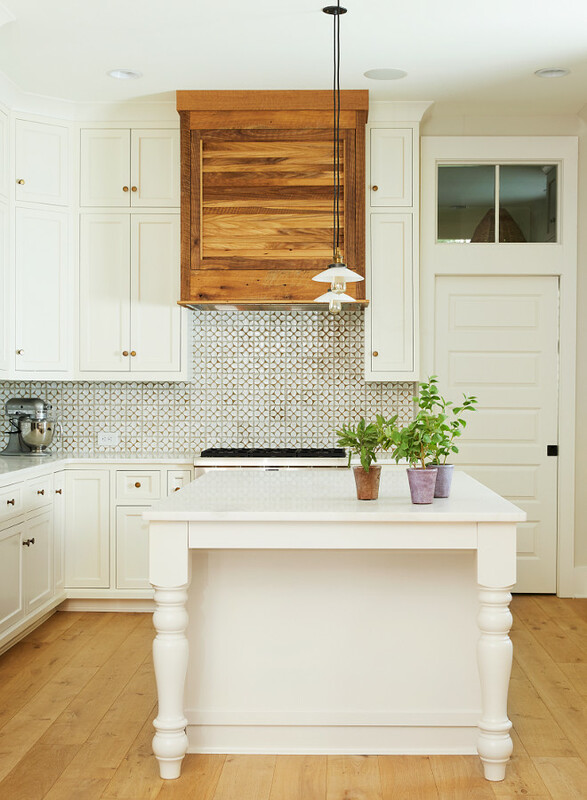 The hood is custom and it’s made of reclaimed Oak. 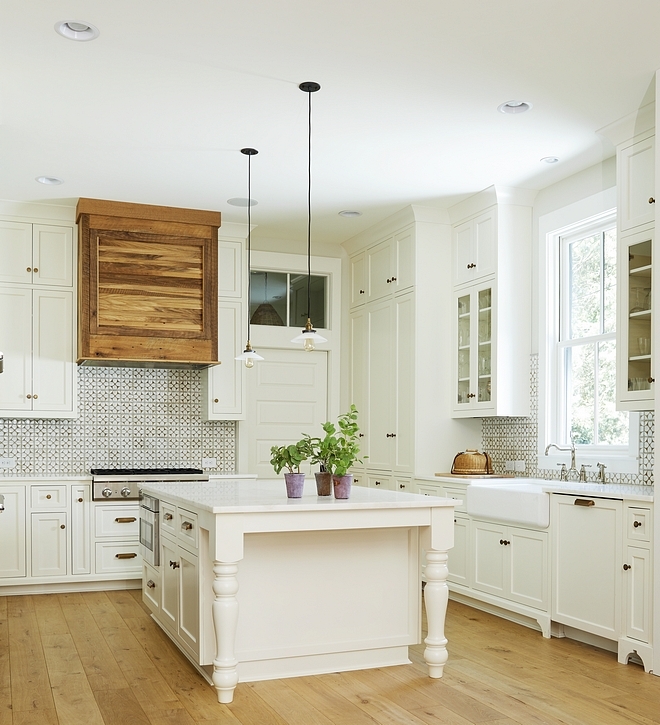 Kitchen Pendants: RH – similar here, here & here. Other Pendants – for every budget: here, here, here, here, here, here, here, here, here, here, here, here, here & here. 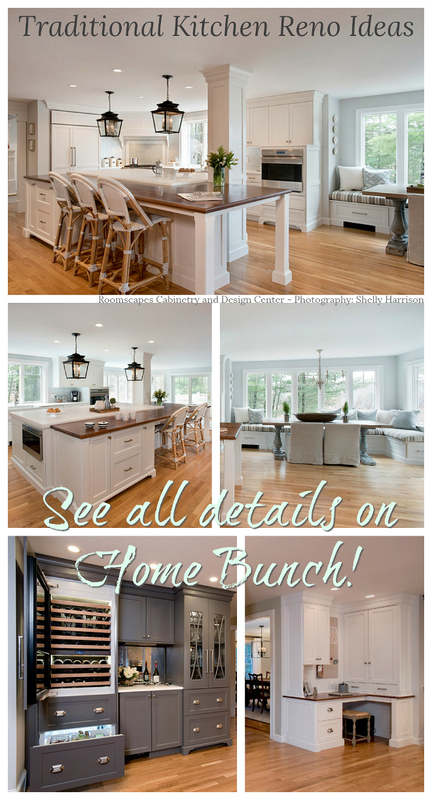 Cabinet Hardware Kitchen: Pottery Barn Knobs and Pulls, Brass Finish. Kitchen Faucet: Brizo Bridge Kitchen Faucet with Spray. Kitchen Sink: Kohler Whitehaven Under-mount Apron Front Kitchen Sink. A low-sheen hardwood flooring adds warmth to this beautiful master bathroom. Wood Flooring is Greyne 3/8” Custom Color. Signature Series – similar here & here. Bathroom Cabinet Paint Color: Benjamin Moore Simply White OC-117 – Satin. Shower Wall Tiles: 6×12 Hampton Marble Polished TS – Grout: Laticrete Permacolor #88 Silver Shadow Diagonal Herringbone throughout, to ceiling – similar tile: here & here. Shower Pan Tiles: 1” Hexagon Marble Mosaics Greecian White – Grout: Laticrete Permacolor #88 Silver Shadow. Bathroom Wall Details: 1×6 Shiplap Horizontal. The bathroom shiplap paint color is Sherwin Williams SW7637 Oyster White – Satin. 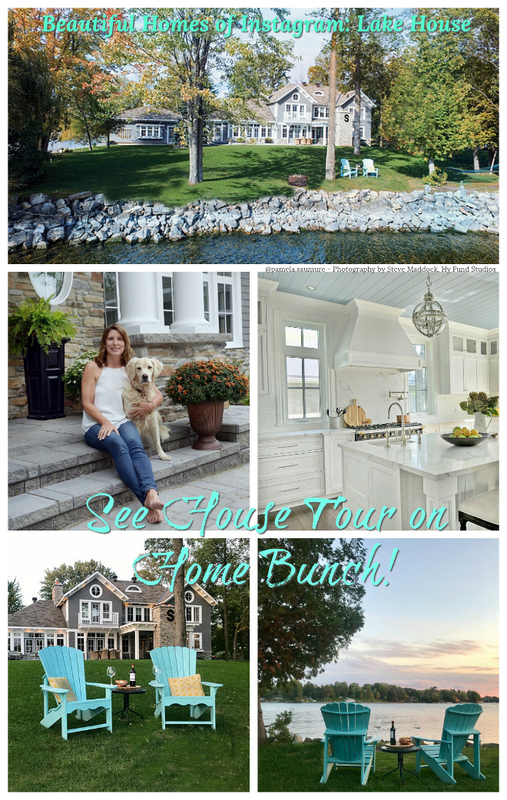 Cabinet hardware is are from a local hardware store in Charlotte – similar here. Mirrors: Custom, 48” high, 36” wide, 1” bevel, frameless – similar here & here. Bathroom Tub American Bath Factory Freestanding Bathtub – Telephone Tub Filler with Chrome Handles. 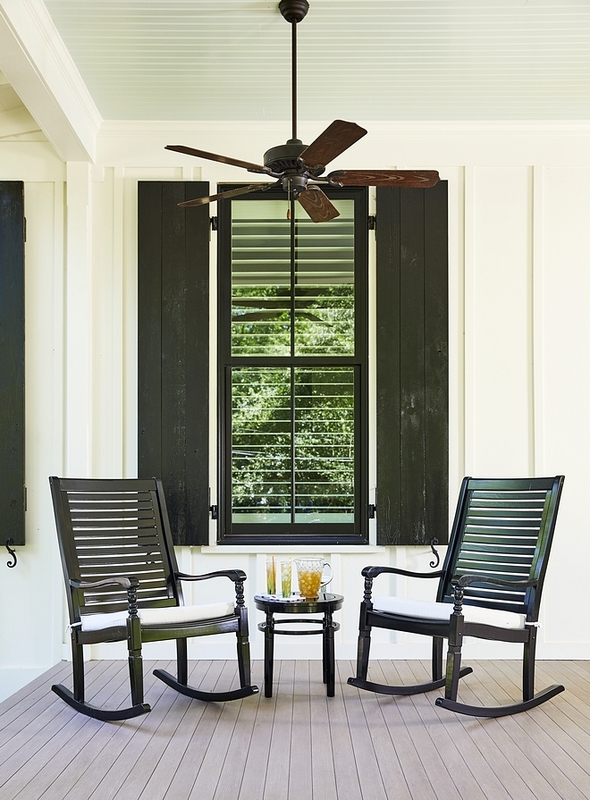 This dreamy home also features dark shutters, painted in Sherwin Williams SW 6258 Tricorn Black. 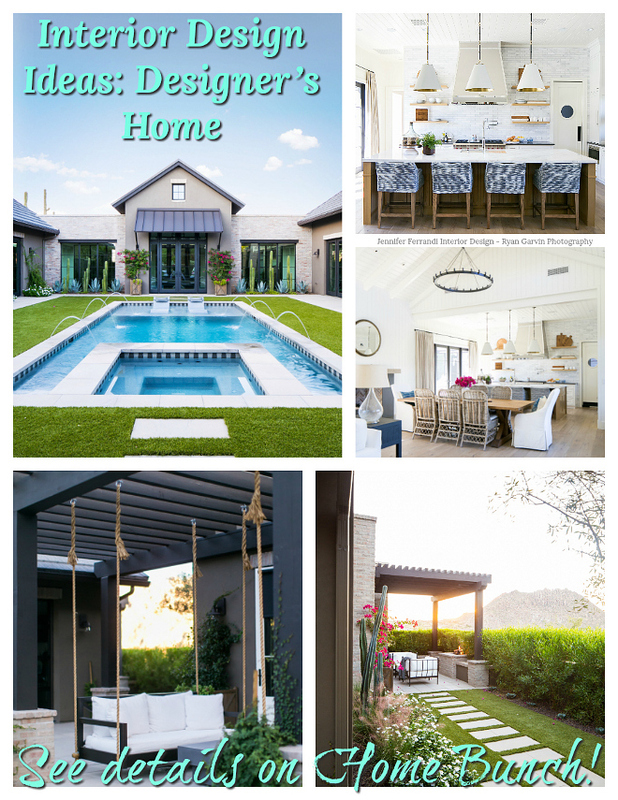 Builder/Design: New Old, LLC – (Instagram). Serena & Lily: Serena and Lily – 25% off Rugs!! !